Pashto. (2004). In A. Dalby, Dictionary of languages. (3rd ed.). [Online]. London: A&C Black. Available from: https://search.credoreference.com/content/topic/pashto_language [Accessed 26 April 2019]. "Pashto." Dictionary of Languages, Andrew Dalby, A&C Black, 3rd edition, 2004. Credo Reference, https://search.credoreference.com/content/topic/pashto_language. Accessed 26 Apr. 2019. (Pushto) One of the two major languages of Afghanistan, the other being Persian. Pashto is spoken by about 12 million people in E Afghanistan and N Pakistan. It is historically the language of the Pathan tribes, and is written in an adapted Arabic alphabet. One of the Iranian languages, it forms part of the Indo-European family of languages. Pashto is one of the two official languages of Afghanistan. 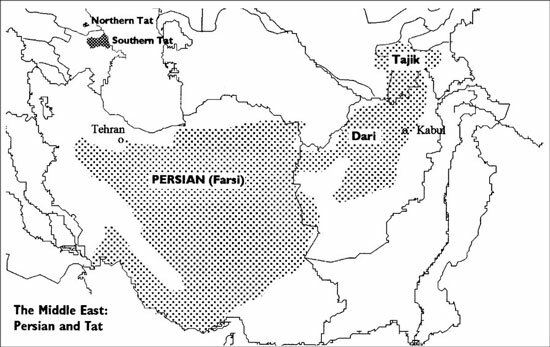 Among modern iranian languages it is second only to Persian in the length of its written history. For the other official language of Afghanistan, see PERSIAN, DARI AND TAJIK. The usual name Pashto (written Pushtu in older English sources) may in origin be identical with Persian, originating in a proto—Iranian form *parsawā ‘Persian language’. The speakers are called Pakhtūn in northern Afghanistan, Pashtūn in the south, and Pathān in Pakistan. The name Afghan is occasionally used for the language. Pashto literature is recorded in manuscript form from the 16th century onwards. A 17th—century author, Khushhāl Khān Khatak, is now regarded as Afghanistan's national poet. But Pashto has become a language of education and the press only in the course of the 20th century. The Dari variety of persian was the language of government in Afghanistan until 1933, when Pashto was given this role. Arabic script is used, in its Persian form, with several added symbols. This state belonged to a people called Patane, lords of the hill country. Just as those who live on the skirts of the Pyrenees, on both sides, control the passes by which we cross from Spain to France, so these Pathans control the only two land routes into India. The first ten numerals are yau, dwa, dre, calor, pinjə, špaž, owə, atə, nəh, las. Pashto has borrowed heavily from Persian, the former ruling language in this region, and from languages of Pakistan including Western Panjabi and Urdu. It has acquired the retroflex consonants ṭ ḍ ṛ ṇ that are typical of the Indian linguistic area. The Pashto—speaking population is almost equally divided between the two countries. Speakers in Pakistan are known as Pathans or Afghans. Kandahar belongs to the South—western dialect group, Kabul to the North—western (sometimes called ‘Eastern’, forgetting the Pakistani speakers). The South—eastern dialects are those of Baluchistan, the North—eastern those of the North West Frontier Province of Pakistan, including Peshawar. 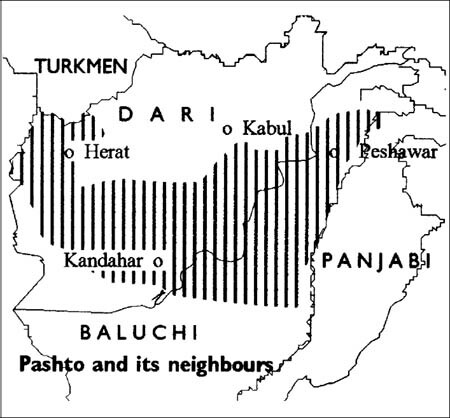 The Kandahar and Peshawar dialects are the basis of the two standard written forms of Pashto. mardān ha ⋎ə̀ day . če kār da bə̀l kā. The real man is he who works for others. Lines 1–2 of a rubā'by Khushhāl Khān. In Pashto, as in Persian, this is a four—line verse form in which lines 1, 2 and 4 rhyme. Each half—line has five or six syllables. (păk'ĭstăn´´, päkĭstän'), officially Islamic Republic of Pakistan, republic (2015 est. pop. 189,381,000), 310,403 sq mi (803,944 sq km), S Asia.